Rice, pizza, and gnocchi substitutes that are all less than $4. If there's one thing people are obsessed with right now, it's replacing as many foods as possible with cauliflower. Mashed potatoes? Over. Buffalo wings? Over. Steak? OVER. Many dishes have fallen victim to the great cauliflower takeover of 2018, but tbh, I love it. At this point in time, having sampled and cooked a few cauliflower substitutions myself, I'm very much on the "cauliflower can do anything" bandwagon. For me, cauliflower swaps are an easy way to add an extra serving of vegetables to a meal, for a usually very small compromise in taste. 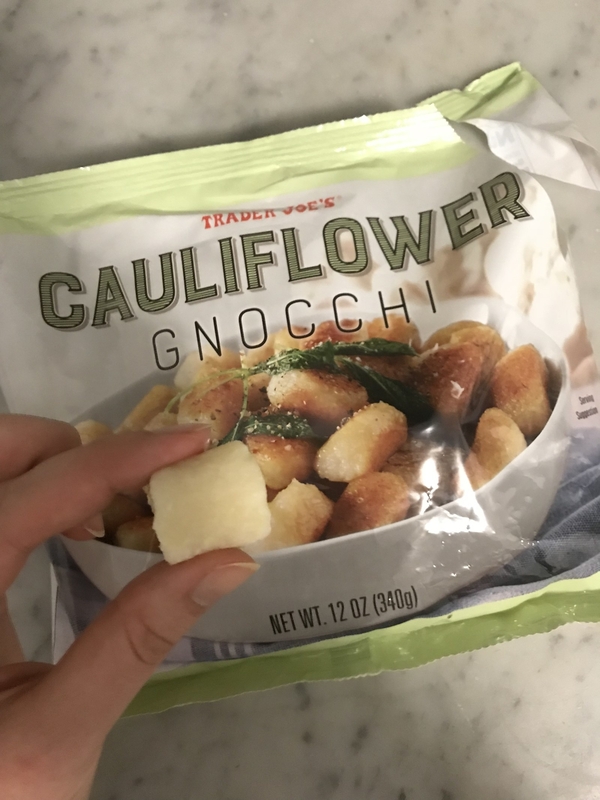 So naturally, when I heard that Trader Joe's have a whole bunch of affordable cauliflower products, I knew I needed to sample each and every one. What is it? A pizza base made from cauliflower, corn flour, cornstarch, potato starch, olive oil, and salt. The process: The cauliflower crust actually took a lot longer to cook than I was expecting. Basically, you flip it upside down and put it in the oven for 10–12 minutes, flip it again, and put it back in for the same amount of time. The instructions also suggest you put the bare base under the broiler for a few minutes to get the crust even crispier. (I skipped this step because it was 8 p.m. and I wanted my pizza!) Finally, you add toppings, and broil for a few more minutes. 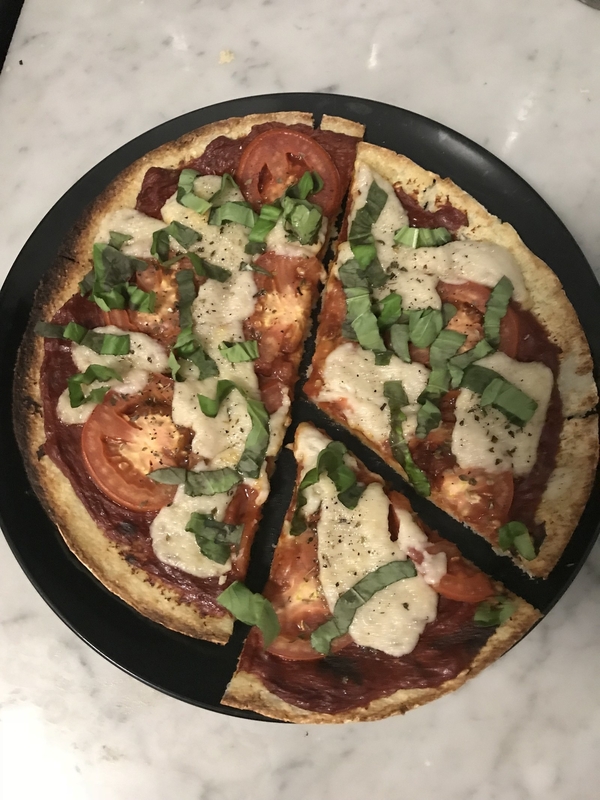 The result: OK so, I must preface this review by saying that you just can't expect a cauliflower pizza to taste like normal pizza — you have to manage your expectations. I did, and was pleasantly surprised! On top of my base I added tomato paste (with added oregano and garlic), sliced tomato, vegan cheese (hence why it looks a bit weird! ), and topped with fresh basil. 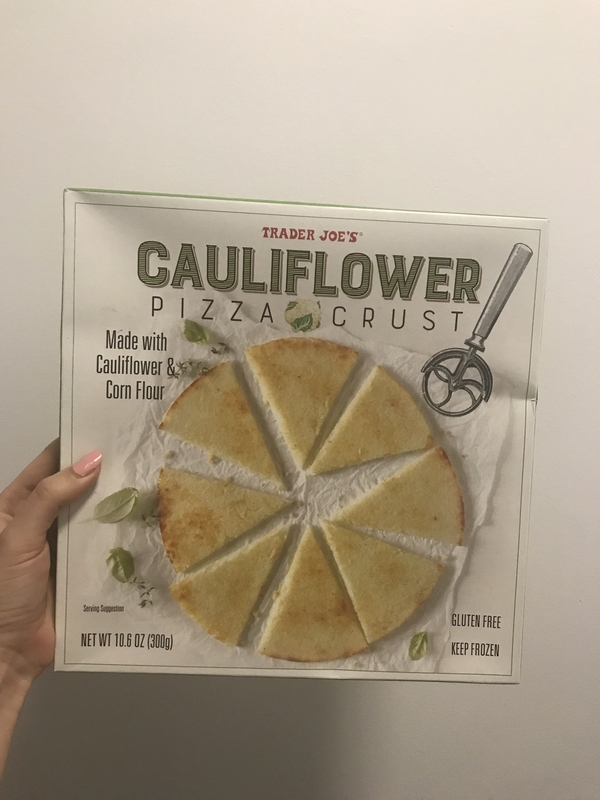 I WISH I took the box's advice and broiled before adding toppings because while the edges of the crust were nice and crispy, the center was a bit...soggy. It was totally delicious but I know it could have been even better. Would I try it again? Yes! And soon! Partly because I need to use the rest of that huge lump of vegan mozzarella, but also because this was so tasty. What is it? 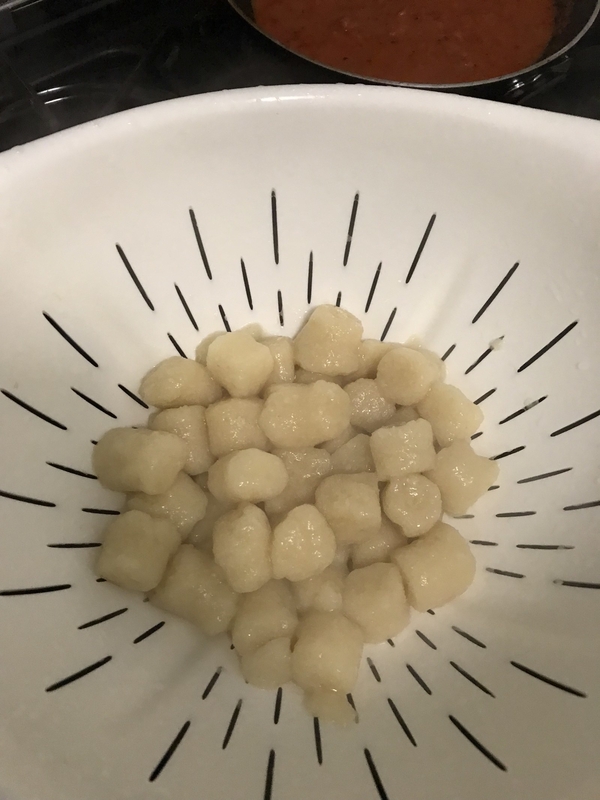 Wheat-, dairy-, and egg-free lumps that are supposed to replicate traditional gnocchi. 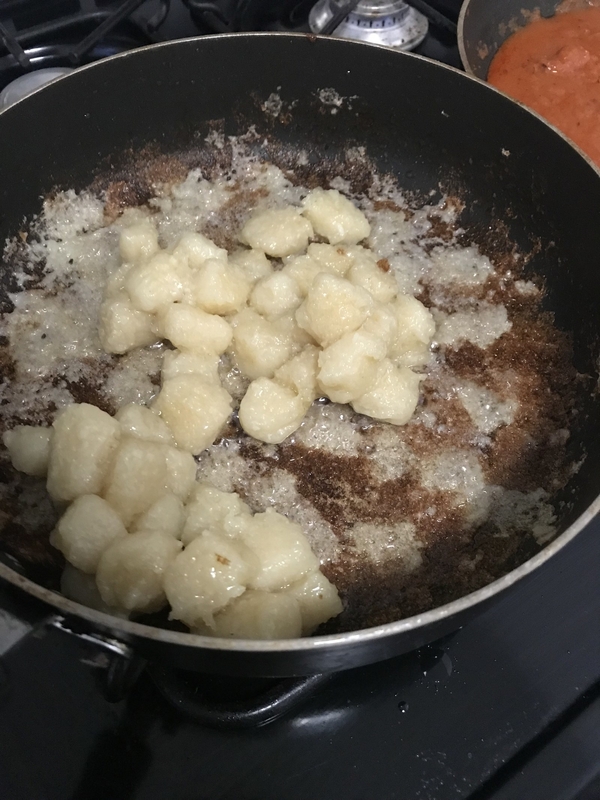 The process: The first time I cooked this cauliflower gnocchi, I followed the "preferred method" of cooking, which involved throwing the lumps in a non-stick pan with 1/4 cup of water and cooking until that water was evaporated. Next, I was instructed to add oil and sauté until browned. Boy, oh, boy, this method did NOT go down well. Though I'm sure cooking experts will be able to point out what I probably did wrong, I truly followed this method exactly. 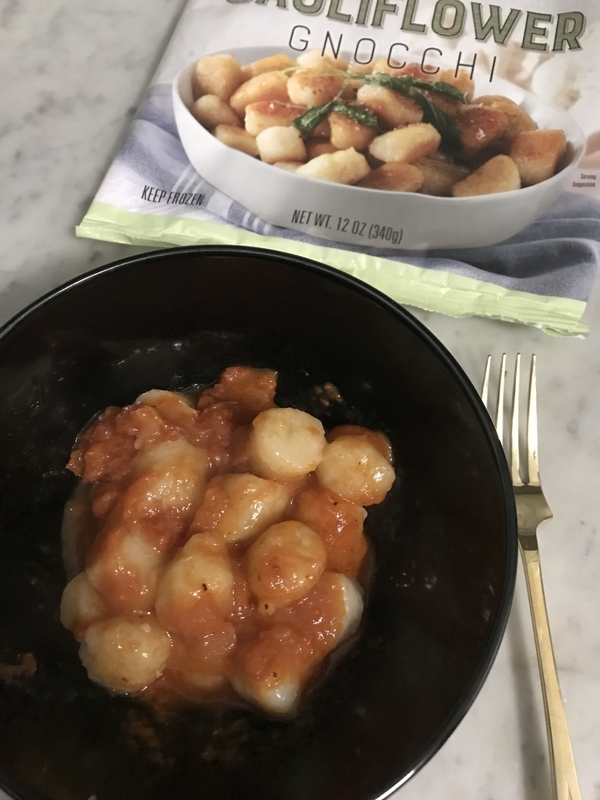 Yet my gnocchi stuck to the bottom of the pan and did not brown at all. Once I added pasta sauce (TJ's Organic Vodka Sauce FYI) it was...fine. But after eating, I had to soak and scrub at my pan all night. I decided to try making the gnocchi again, this time following the second method listed on the pack: boiling. This was a lot less messy, and I didn't lose half my food to the bottom of my "non-stick" pan. The result: The boiling method worked, sure, but these little things still tasted nothing like gnocchi. I know a cauliflower-version is never going to perfectly replicate the real thing but the taste and texture just wasn't close. Would I try it again? Nope. Even if someone told me how to avoid cooking disaster, I just don't think these were a great substitute for me. What is it? Once called "malicious and nefarious" by the president and CEO of USA Rice, cauliflower "rice" isn't actually rice (ICYMI! ), but is actually just regular old cauliflower that's been chopped up very small to mimic real rice. That's all that's inside this packet: finely chopped cauliflower. The process: To cook the "rice", all you have to do is pour the bag's contents into a non-stick pan, then sauté until heated through and all the water has evaporated. So easy! 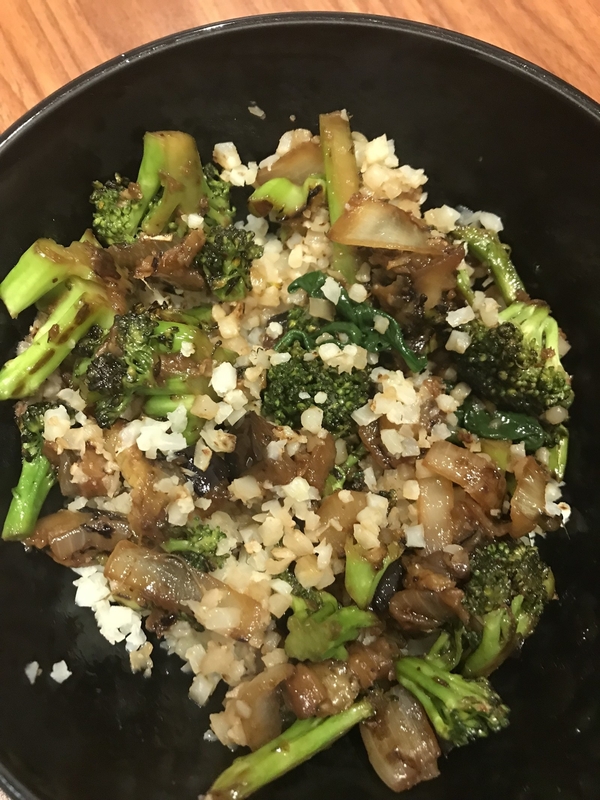 The result: I've made my own cauliflower rice (using both a grater and food processor) many times, and while I love it as a substitute for the original, I've always hated how messy it is to prepare — cleaning the food processor is The Worst. This pre-packed stuff took away my only con and left all the pros (plain taste, rice-esque texture) for me to enjoy with a simple vegetable stir-fry. Would I try it again? I would! This bag is less than $2 and can be left in the freezer until a night I'm feel exceptionally lazy. What is it? The same finely chopped cauliflower as above, with added fun things! 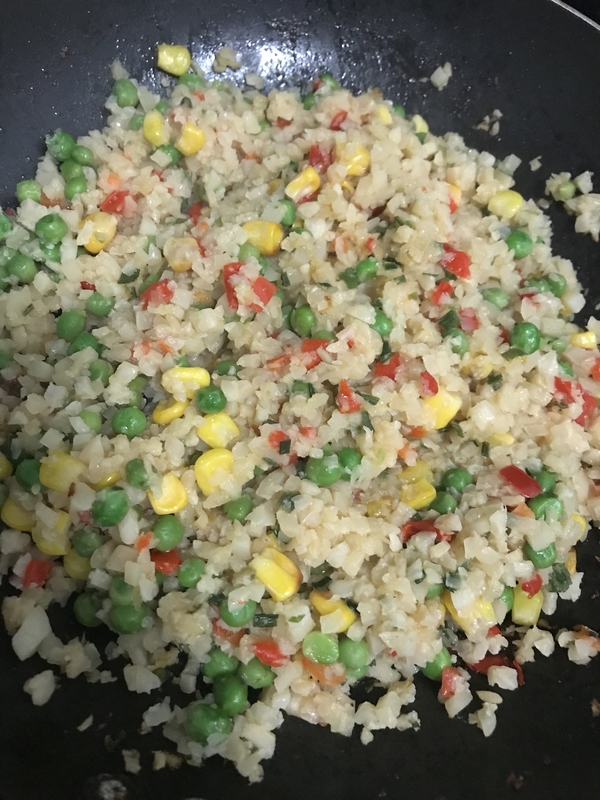 To mimic the kind of fried rice you already know and love, this mix includes peas, red peppers, corn, tamari, spring onions, sesame oil, and ginger. The process: Again, this is super easy to make! Add a little oil to a non-stick pan and cook. What's great about this is that all the flavor is already added. The result: It was really yummy! And the bag made a lot of fried rice. 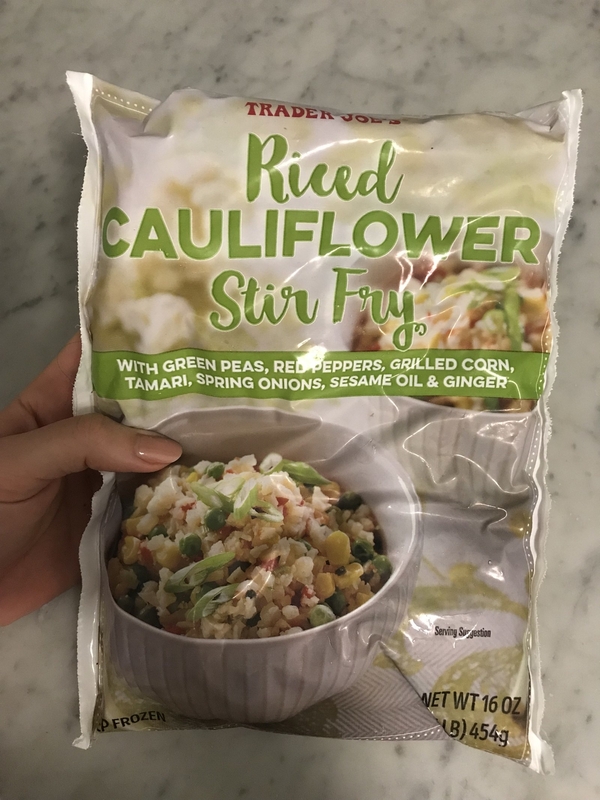 I have to admit that I probably prefer the cauliflower rice I make myself with cauliflower, peas, corn, onion, and soy sauce because it tastes a little fresher, but this was just so damn easy. Would I try it again? Sure! Again, this would just be a handy thing to have in the freeze for nights you really can't be fucked. If you added some protein (egg, chicken, or tofu) it would make a really quick and simple meal. What is it? 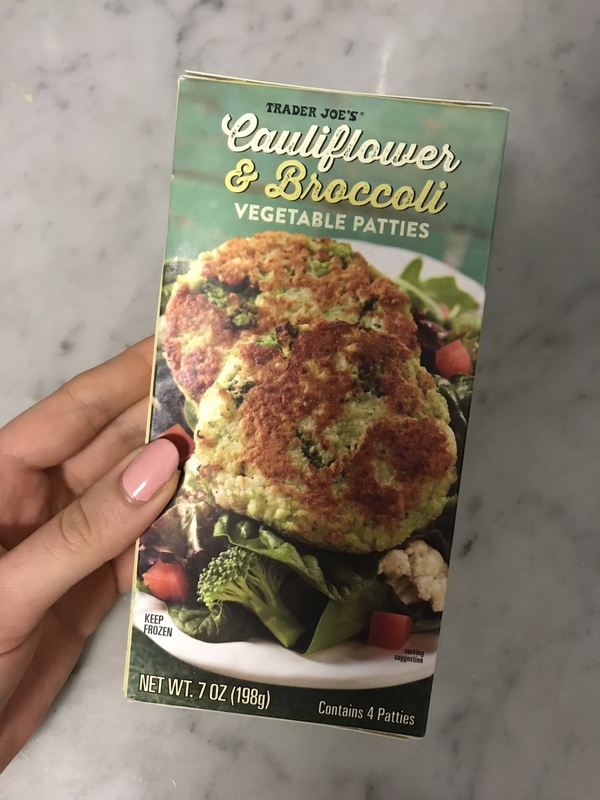 While not technically a straight cauliflower product, these were the only TJ's veggie patties to include the wonder veggie, so I needed to try them. The process: Add a little oil to a pan, then pop your patties in. Turn after five minutes, and cook until both sides are brown and delicious-looking. 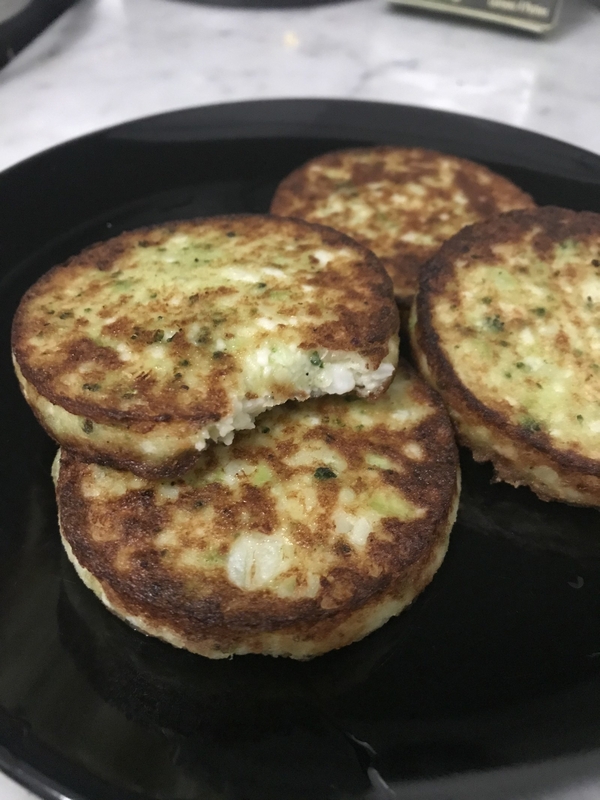 The result: Look, I loved these patties but I need to be honest: These are way more potato patties than they are broccoli and cauliflower patties — you can see how obvious it is where I prematurely took a bite out of a patty above. 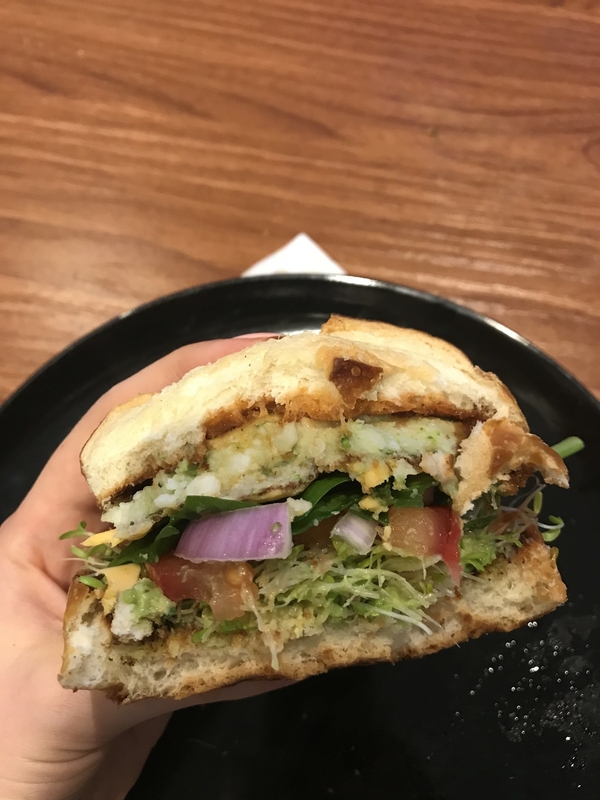 I served these on a pretzel bun with salad and vegan cheese, and while it was a really good burger, I think these patties would maybe be better suited to a breakfast/brunch meal as a hash brown-adjacent side. If you're after a super traditional veggie burger patty, these probably won't satisfy your craving. Would I try it again? Definitely! But as I said, I'd prefer to eat these on their own rather than on a burger, which, to be fair, is how they're served on the box. 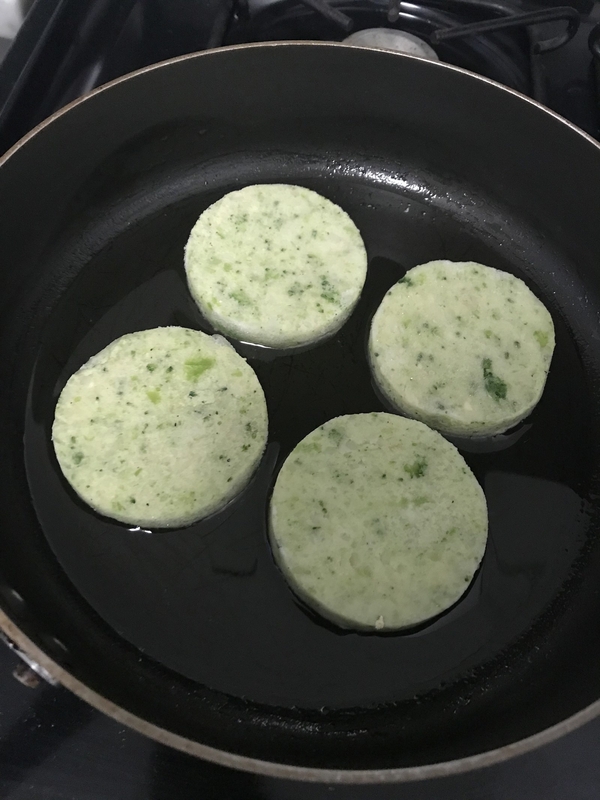 * The broccoli and cauliflower patties were the best product I tried. They were easy to cook and very easy to eat, though I won't put them on a burger again. * The gnocchi was my least favorite product. I'm sure there is a way to cook them so they're just right, but I like an easy dish, and those weren't that. 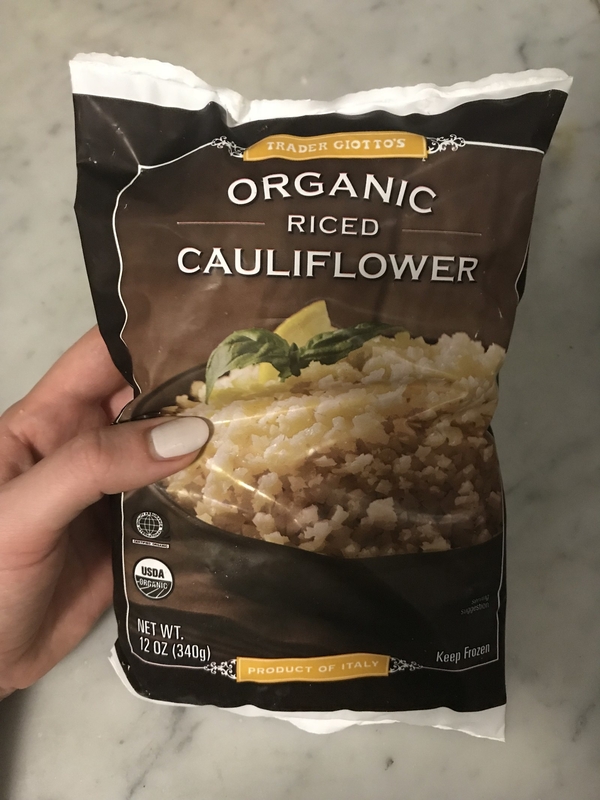 * Riced cauliflower is so easy to DIY, I'm not sure I can personally justify buying it pre-packaged in plastic. However, these products would be great for anyone who didn't have the tools, time, or ability to rice their own fresh cauliflower.